ATHENS: The Greek coast guard said on Wednesday, a passenger ferry with 1,016 people onboard is returning to the port of Piraeus after a fire broke out while the vessel was en route to Chania, on the island of Crete. 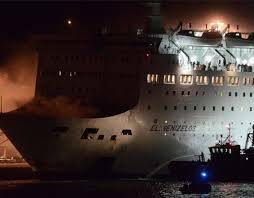 The Eleftherios Venizelos ship, with 875 passengers and 141 crew, was sailing off the island of Hydra, when it notified the coast guard that a car parking compartment caught fire around midnight. However, the situation is not worrying and the ferry is expected to dock at Piraeus in about 10 minutes, the official added.